Although it is known locally as Lislaughtin Abbey, it was founded as a Franciscan friary. It is 1.3 km north of Ballylongford, on the east bank of the River Ballyline and the Ballylongford Creek and to the south of the Shannon Estuary. 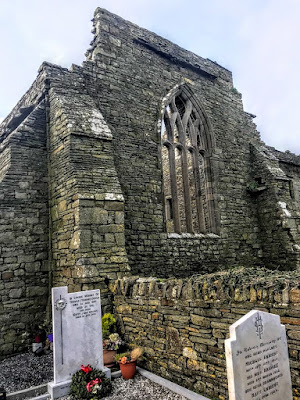 The friary was founded for the Order of Friars Minor or Observant Franciscan Friars in 1470 by John O’Connor, Lord of Kerry, John O’Connor endowed the friary with altar vessels and other furnishings. 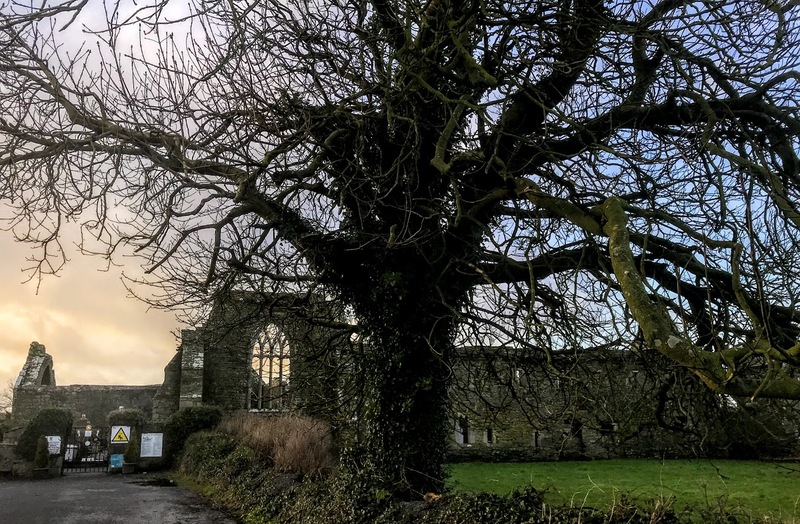 The foundation, in the Diocese of Ardfert, was later approved by Pope Sixtus IV in 1477, who instructed the Prior of Ballinskellings, the Archdeacon of Aghadoe and the Dean of Ardfert to grant the license if the site was suitable. 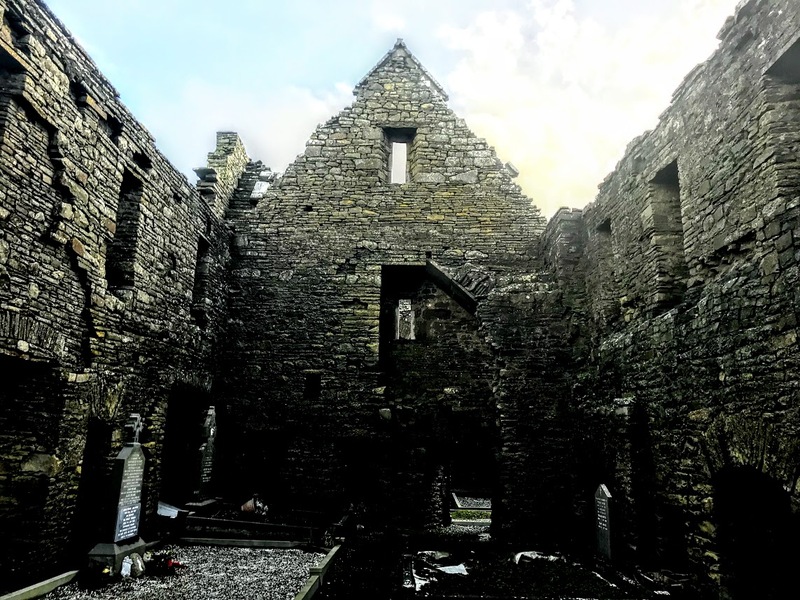 The friary was named after Saint Lachtin, who is said to have brought Christianity to the area, and who died in 622. No written life of Saint Lachtain or Lactean has survived. However, a short biographical note was written about him by the Anglican hymn-writer, the Revd Sabine Baring-Gould. And he features in the lives of a number of other Irish saints, where some miracles are ascribed to him. This saint, also called Lactenus, Lactinius and Lactanus, came from a distinguished family in Muskerry, Co Cork. According to legend, while Saint Molua lived as a disciple of Saint Comgall of Bangor, an angel appeared to him and predicted the birth of Lactinus – after an interval of 15 years – who was to be his future friend and companion. Afterwards, it was related, that Saint Molua never smiled until he heard of the infant’s birth. Saint Lachtain was born some time in the sixth century, and his mother is called Senecha. The accounts of his birth are drawn from accounts of the births of Jacob, Jeremiah and Saint John the Baptist, who were blessed before they were born. It is said that as an infant Lactinus was miraculously preserved from suffering and also healed his mother from a dangerous tumour and saved neighbours’ cattle from a plague. When he was 14, he moved to Saint Comgall’s new abbey in Bangor, where Saint Molua was his teacher. He was sent out to found religious houses, and these included Achadh Úr or Freshford, Co Kilkenny, where he gave his name to Saint Lachtain’s Church, the Church of Ireland parish church. In defence of the men of Munster. Cornelius O’Connor and his wife, Avelina FitzGerald, donated a processional cross to Lislaughtin Friary in 1479. The silver gilt cross bears the figure of Christ and the symbols of the Evangelist set at the ends of the cross arms. The figures on the collar below the crucifixion represent Franciscan friars or Saint Francis. 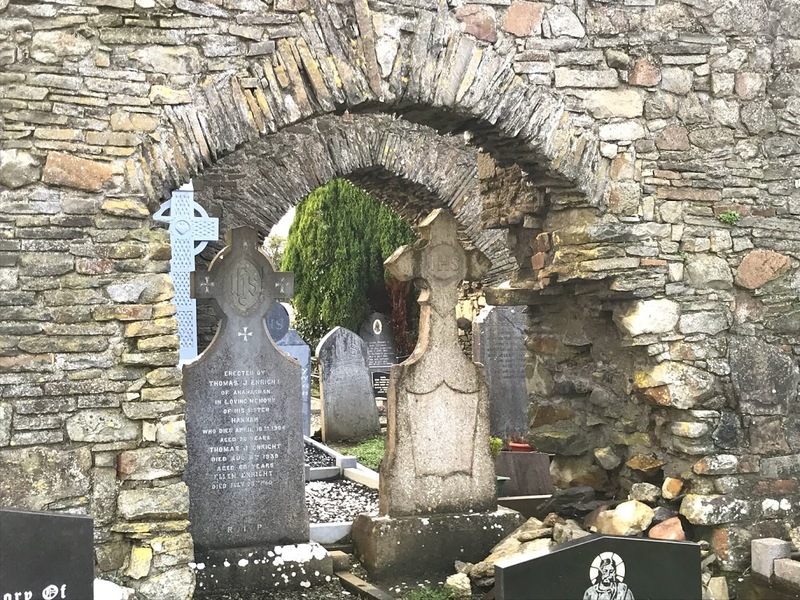 When John O’Connor resigned as Lord of Kerry in favour of his son he retired to the friary as member of the Franciscan Third Order, and he was buried at the friary in 1485. The friary was so important in the Irish mediaeval church that a Franciscan provincial chapter was held in Lislaughtin in 1507. Thomas FitzGerald, heir of the Knight of Glin, was buried there in 1567 after his execution. During the siege of nearby Carrigafoyle Castle in 1580, the abbey was twice raided by Elizabethan forces. Three friars, Daniel Hanrahan, Maurice Scanlan and Philip O’Shea, were unable to make their escape and were beaten to death in front of the high altar. The friary was sacked and the buildings were destroyed. 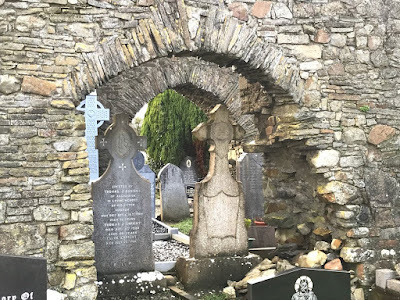 The cross donated by Cornelius O’Connor and Avelina Fitzgerald was possibly hidden for safekeeping at this time, and the friary was then dissolved. 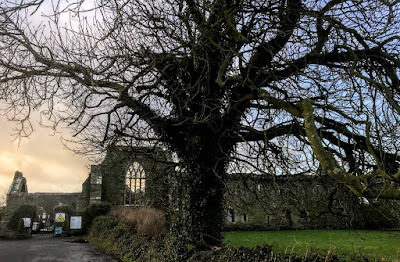 In 1617-1618, a Franciscan friar, Donatus Mooney, describes the friary as being ‘solitary and surrounded by woods’ which suggests it was then unoccupied. The friary was granted to James Scolls and then to Sir Edward Denny. The church and graveyard remained in use by local people, and some friars returned in 1629. But it was destroyed once again by Cromwellian troops in 1652. A sketch in 1792 shows a typical slender Franciscan tower was still standing that year, but the tower collapsed some years later. 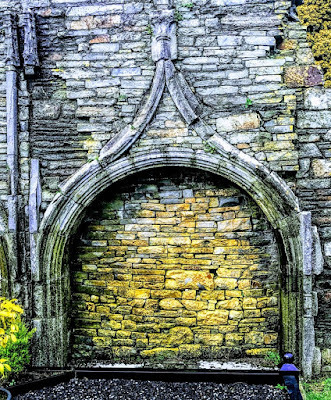 The friars continued to maintain a presence in the area, and the Franciscans appointed guardians until 1860, perhaps in the hope of recovering their friary. Lislaughtin retains some fine examples of late mediaeval stonework in the great east window, the sedilia, piscina, choir windows, the great window in the south transept, the west window and the tombs of the O’Connor and FitzGerald families. The abbey church is a long building divided into choir and nave with triple sedilia. The collapsed square tower was over the choir arch. The 30 windows are pointed and of cut limestone. A two-storey building contained refectory and dormitory. The friary remains today include the church with a south transept, the cloister and domestic buildings located to the north. One of the two carved tomb niches on the north side of the nave was possibly made for the burial of John O’Connor, the friary’s founder. In the chancel on the south side there are sedilia or seats for the clergy. The friary had a library and a scriptorium on the top storey which was accessed from the friars’ dormitory. The dormitory cubicles have a recess under each window, possibly a storage area for friars’ personal items, such as books or writing utensils. 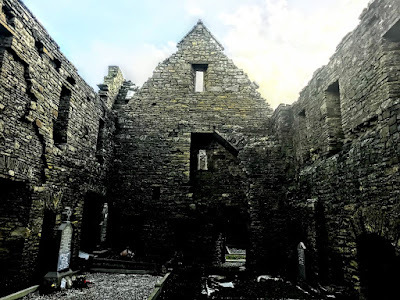 The friary’s garderobe or latrine block is a two-storey structure to the north-east. The silver processional cross commissioned for the friary in 1479 was made by William Cornel of Dublin. It lay hidden for over two and a half centuries until it was unearthed in March 1871 by John Jeffcott, a farmer who was ploughing some reclaimed bogland at Ballymacasey, south of Lislaughtin. Although some pieces of the cross were missing and it had suffered minor damage, the cross is still largely intact and in good condition. It The cross remained in the Jeffcott family home in Ballylongford for 18 until it was acquired by the Royal Irish Academy for preservation and public display. 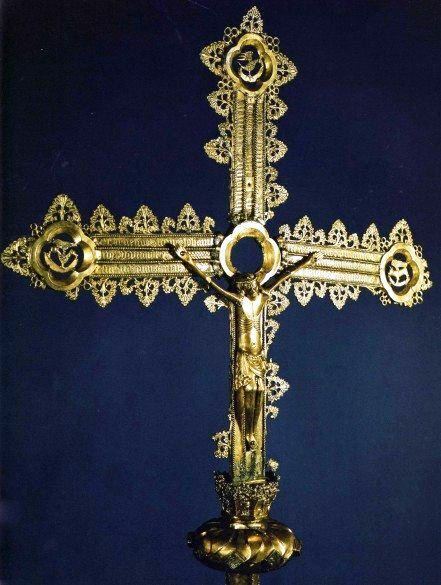 The cross is 67 cm tall and is made from silver gilt. It was made into a complete piece from four separate components: the cross itself, with the horizontal bar attached by sockets and rivets; a collar below; a knop or rounded knob; and a hollow socket for attaching a handle. A figure of Christ, which was cast separately, adorns the centre of the cross. The cross is covered with a floreated outline that is typical of the late Gothic period and gives it a particularly ornate look. The back of the cross is plain. The inscription is engraved in three lines on each arm of the cross and the text is interlaced with flowers and animals. At the end of each arm and in the centre are quatrefoils, each with the symbol of one of the four evangelists: an eagle for Saint John, a lion for Saint Mark and calf for Saint Luke. The fourth quatrefoil in missing the human figure, representing Saint Matthew. The stylised figure of Christ has rivulets of blood, elongated arms, a crown of thorns and a moulded loincloth. The figure is attached to the cross with three small nails, one in each hand and one at the feet. Christ’s eyes are closed and his protruding ribs and the wound in his side are clearly visible. Beneath the cross, an eight-sided flared plinth or collar has a series of cast monks or friars, each holding a cross in his left hand while the right hand is raised in blessing. This collar is set on a twisted knop with another eight-sided decoration of rosettes and leaves. This knop sits on of a tapering circular socket with a decoration of serrated ribs, where a metal shaft would have been attached to carry the cross in processions. The Lislaughtin cross is similar in style to the 40 or so processional crosses found in Britain and Ireland dating from the same period. They include the Bosworth Crucifix, which once belonged to the Victorian book collector and antiquarian James Comerford (1807-1881), and a 15th century processional cross in the Hunt Museum in Limerick. James Comerford’s son, James W Comerford, exhibited and presented the Bosworth Crucifix to the Society of Antiquaries ‘in the name of his late father, James Comerford, Esq., FSA.’ The processional cross in the Hunt Museum was bought at auction in Christies in 1961 by John Hunt for £130. The Lislaughtin Cross is now in the National Museum in Kildare Street, Dublin. Behind the scene are the words ‘Remember Me,’ recalling the cry of the Penitent Thief reported only in Saint Luke’s Gospel: ‘Jesus, remember me when you come into your kingdom’ (Luke 23: 42). At the foot of the cross stand the Virgin Mary and Saint John the Beloved Disciple, who holds in his hands a book – perhaps the Fourth Gospel, perhaps the Bible – inscribed with the Greek initials ‘IC XC,’ the Greek initials for Jesus Christ, Ἰησοῦς (ὁ) Χριστός. Beneath this panel, the inscription in terracotta capital lettering reads: ‘Is it nothing to you all you who pass by.’ This is a quotation from the Book of Lamentations: ‘Is it nothing to you, all you who pass by? Look and see if there is any sorrow like my sorrow, which was brought upon me, which the Lord inflicted on the day of his fierce anger’ (Lamentations 1: 12; see Jeremiah 18: 16). Tomorrow: Station 13: Jesus is taken down from the cross.